Isn’t it interesting how you can completely change your way of thinking in the blink of an eye in one of those rare “aha” moments? You’re doing some completely unrelated mindless work and suddenly everything clicks. Everything makes sense and everything you thought you knew changes. You think, “Whoa! How did I not realize this sooner?” And I find it even more interesting that – most times – these moments happen when you’re not even searching for an answer. Last night my “aha” moment actually applied to myself. I realized I have been changing. Or maybe I have already changed. Maybe it’s temporary. I don’t know. But I did three very big and very out-of-character things recently. Right under my own nose. And these out-of-character actions led me to rethinking my entire way of “living”. #1 – I joined a softball league. This was probably the biggest of the three “whoas”. First and foremost, let me explain one thing. Up until recently, I have always thought I was a skilled athlete. I always thought I was in pretty good shape and mostly capable of anything you could throw at me. I didn’t think I was invincible, but I definitely had unrealistic expectations for myself. That said – The first thing that “hit me” was that I realized I’m *deep breath* a terrible athlete. I’ve been graced with an athletic frame but I’m extremely uncoordinated. Give me a ball – any ball for any sport – and I’ll screw up. Bad. REALLY bad. So I avoided sports with balls and only allowed myself to participate in things I was confident I would do well with. And the things that I did do, I climbed the ladder fairly quickly. I got used to being “the best” or darn near close. I went tunnel vision and thought only about the things I was good at and pretended the rest didn’t exist. That way I was able to legitimize my “I’m good at everything” way of thinking. Meanwhile my experiences with different activities became more and more limited. I opted to sit out and watch almost everything, pretending to be uninterested, when really, I wanted to participate but I was very scared of making a fool of myself. Now fast forward to this year. I joined a sport with a ball. A ball I have to hit and catch and throw accurately. And I joined this sport when I was in the worst shape of my life. I was so bad right from the start. I whiffed at bat, I missed easy fly balls and I overthrew the ball. A lot. That leads me to the next thing I realized about myself. I’m not used to being the worst at something. I’m not used to being last. I’m not used to being the weakest link. But the reason I have never been the weakest link is because I’ve never allowed myself to be in that position. I never took risks. I never stepped out of my comfort zone. And here I am. 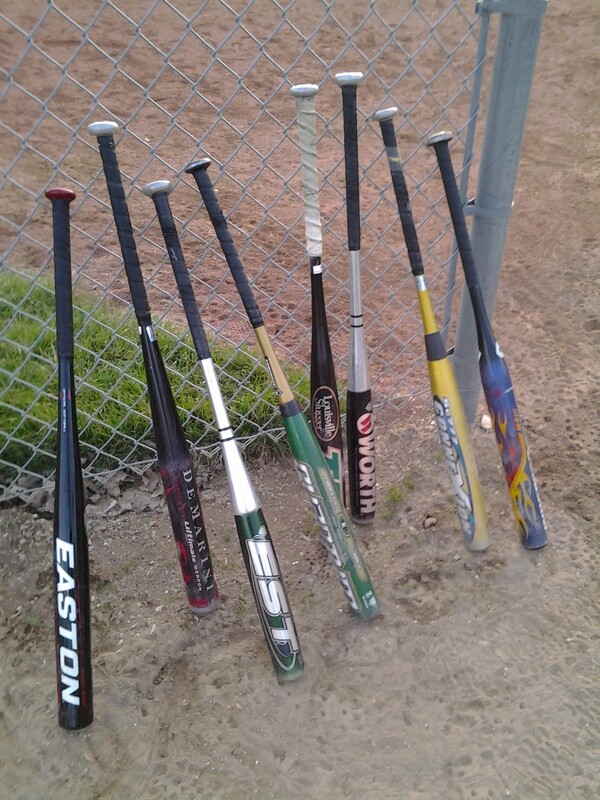 Playing softball. Terribly, but still playing. Probably the worst on the team, but still playing. I’m so far out of my comfort zone every time I step out into the field and that will probably never change. I may end up being the weakest link all season. But I’ve finally come to terms with my “athleticism”. I’m not an athlete. I’m not coordinated. I’m not even that fast of a runner anymore. But I’m having fun. I’m laughing and having fun with a group of ladies that I happen to have quite a bit in common with! Sports really can be fun if you can learn to laugh at yourself and enjoy the moment. I finally get it. Okay. two things. 1.) I have a debilitating fear of public speaking. My hands shake, my voice sounds like I’m about to cry and I’m pretty certain the anxiety attacks will kill me one of these days when my heart is about to explode from my chest. 2.) 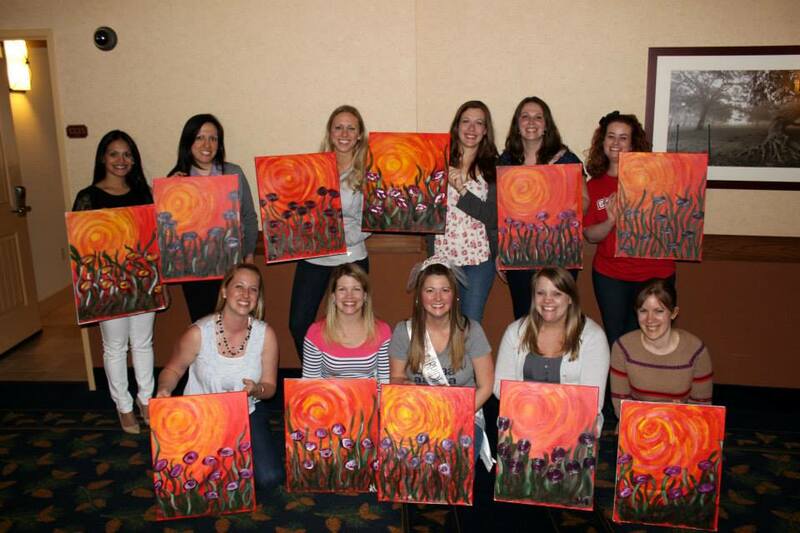 The class was a group of ladies for a bachelorette party. There was nothing official about this teaching or class. My cousin is getting married this week and her bachelorette party was this past weekend. Her sister (my other cousin) was planning the party and was trying to get a local lady that does a painting party. At a painting party, you’re provided with a canvas, paint and supplies and the teacher will take you through a painting step-by-step while you enjoy some wine and visit with the other classmates. When my cousin found out she couldn’t get the painting party, I was really bummed because I thought that would have been really fun. So, since I enjoy painting on occasion myself, I offered to take the group through a painting if we could gather our own supplies. Everyone agreed and the ad-libbed painting party was planned. I was super excited about it until about ten minutes before we started. I was setting up my easel and displays and turned around to find a group of ladies – all eyes on me. Waiting on me. To teach them. To present. To be in charge. Crap. CRAP. OH, CRAP. CRAPCRAPCRAPCRAPCRAP. And then I realized none of them were even looking at me. They were looking at my displays. They were talking excitedly and nervously amongst themselves about not “being that good” and putting their skills down before they had even touched a brush. I took that lifeline and held on like my life depended on it. I had been so excited to share this thing that I have always been passionate about and I wasn’t going to let my fear get in the way of that. Especially when I knew how proud these ladies would be when they finished! And I wanted to give that to them. Sharing my knowledge became more important than hiding behind my fear. So without even knowing it, these ladies helped me overcome my own anxiety while I helped them. Last night I offered to help knock out some of Husband’s to-do list. Normally I treat his projects like the plague and stay far, FAR away from them. They usually require the use of terrifying tools that I could kill myself with like chain saws, blowtorches or nail guns. Add in the fact that I’m a very clumsy person and, well, let’s just say we both prefer I stay away from his to-do list. But over the last week he fell behind on his list because he was working on some woodworking projects I asked him to make and I thought it was only fair that I at least try to do something from his list in exchange. I scanned the list and the blood drained from my face as I repeated “crap, crap, crap”. Electrical stuff, car repair stuff and things requiring no small amount of knowledge in construction. Nothing looked do-able for me. Except… maybe one. 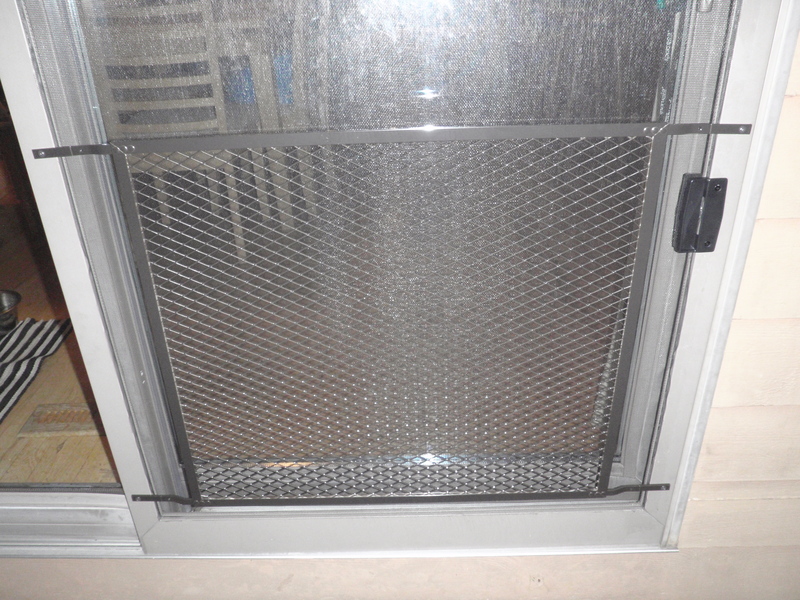 I had asked Husband to fix the torn up screen door, put on a guard and add lower handles that the kids can reach. Normally I’ll tell husband I will do something for him and I’ll have every intention of finishing it. But somewhere along the way I’ll lose hope (or ambition) and I’ll tag him in on the project. But this time I was determined. I went out to the local hardware store and found a screen guard, screen, supplies to set the screen and door handles. I took down the door, pulled out the old screen, set the new one, measured out and drilled holes for the screws for the guard and new door handles (after digging around and finding a cordless drill, a charged battery and the appropriate sized drill bit) and I “installed” everything. I set the door back up and put everything away. I did it. I laughed at myself at how childish I sounded, but I was seriously so proud that I did it all by myself. Everything. From shopping for parts, to the actual repair/installation to finding the tools. Everything. I think I often sell myself short when it comes to these jobs that are out of my comfort level. And I often take advantage of having an incredibly handy husband around. I’ve grown lazy and incompetent. And, just like the athletic thing, I was afraid of looking stupid so I avoided something I didn’t know a lot about. Right after setting the door back up and stepping back with a proud I-did-it-myself grin on my face, that’s when all of this hit me in that “aha” moment. Was I really coming out of my shell? The shell I had built up as an impenetrable wall of fear? The wall that I had hidden behind my entire life? I began to rack my brain and I shocked myself with how many examples I could come up with. Making new friends. Volunteering to help with projects or even lead them. Building things that I have no experience with. Joining in on activities that I wasn’t comfortable with. Instigating other activities… the list goes on. Had I really been growing and changing so much without even knowing it? The answer was a resounding YES. Last night I redefined myself. I’m still an introvert. I will always be an introvert. But I’m not afraid anymore. Somewhere along the line, I stopped hiding behind my fears. I stopped hiding behind excuses and I started living. And the laughter and fun that followed was worth stepping over every one of those boundaries I had laid down for myself. I am capable of so much more than I gave myself credit for and I can’t wait to see what else I’m capable of!